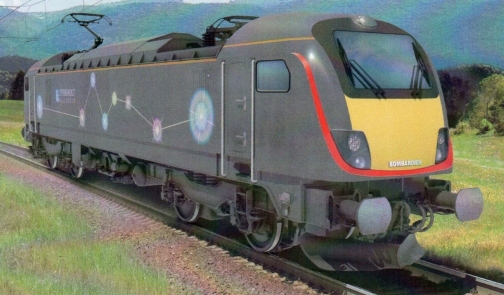 An interesting article from December 2012, we would like to share with you: the East Coast Main Line train concept. Although Agility (Hitachi and John Laing) are preferred bidder since 2009(!) and now most certainly will built the new generation of intercity trains for Great Britain (IEP or Intercity Express Program), other companies do not cease to offer cheaper alternatives to buying new rolling stock. Okay the class 91 locomotives, currently hauling the intercity, is due for replacement, but the Mk4 coaches could serve longer if wanted. Eversholt Rail Group, Bombardier and Wabtec offer a serious alternative to the Hitachi trains and even built a 1:1 scale mock-up of a refreshed mk4 passenger coach. Again the Bombardier Traxx UK locomotive with additional diesel engine is mentioned to haul the updated rolling stock. It is referred to as the new class 93. The whole idea has been presented to the UK Department for Transport. It is remarkable plan in times in which trainsets seem to be the most economic solution for transporting passengers. Let's keep this in mind. New electrics for the UK? Bombardier think the time is right and unfolds its plans with the Traxx UK concept. Railwaygazette brings the complete story. Bombardier initially aims at passenger services - the Greater Anglia and InterCity East Coast franchises - with a Traxx P200 AC configuration. However, also freight can be served, with or without the recently introduced Last-Mile option.